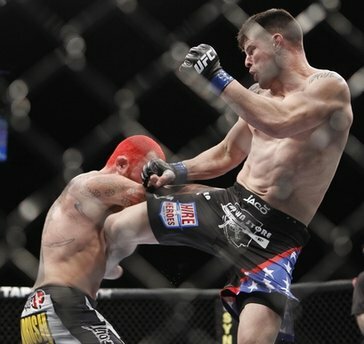 We point you directly to the experts: Our good friends at MMAJunkie.com are reporting that former Marine Brian Stann has been scratched from his upcoming middleweight bout against Hector Lombard, which was to be a five-round main event for the Aug. 4 UFC on Fox 4 card in Los Angeles. MMAJunkie did not report the nature of the injury. Ariel Helwani, a well-known MMA journalist and frequent TV interviewer/host/personality, reports at MMAFighting.com that Stann suffered a shoulder injury that will not require surgery, but could keep him out of the octagon for up to eight weeks. There has been no confirmation of the injury by the UFC or by Stann himself.